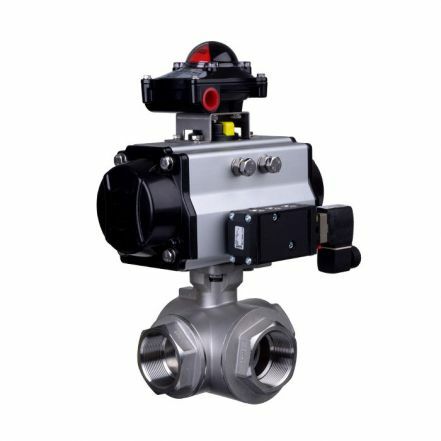 Mars Ball Valve Series 39, three way reduced or full bore direct mount stainless steel ball valve with PTFE seat and ISO mounting top. Available in Screwed BSP or NPT, L or T port, sizes: 1/4" to 2". Provides safe operation for both general and industrial chemical applications. Covers the following IDs: 141600, 141601, 141602, 141603, 141604, 141605, 141606, 141607, 141608, 141609, 141610, 141611, 141612, 141613, 141614, 141615, 141616, 141617, 141618, 141619, 141620, 141621, 141622, 141623, 141624, 141625, 141626, 141627, 141628, 141629, 141630, 141631, 141632, 141633, 141634, 141635, 141636, 141637, 141638, 141639, 141640, 141641, 141642, 141643, 141644, 141645, 141646, 141647, 141648, 141649, 141650, 141651, 141652, 141653, 141654, 141655, 141656, 141657, 141658, 141659, 141660, 141661, 141662, 141663.